The tea leaves were swirling Tuesday after Jay Clayton, chairman of the U.S. Securities and Exchange Commission, dropped some hints about what regulators in the United States will (and won’t) do in the crypto space in the coming months and years. Clayton gave a fireside chat in front of a packed room at CoinDesk’s Consensus: Invest event in Manhattan yesterday afternoon. And while Clayton made it clear that he has given cryptocurrency a lot of thought over the last year, there was still plenty to read between the lines, including his thoughts on the exchange ecosystem and the question of when ICO-derived tokens count as securities. Following the on-stage conversation, three longtime experts in crypto law dissected the nuances of what Clayton said during a taping of CoinDesk Live (which you can watch below). We were joined by Caitlin Long, of the Wyoming Blockchain Coalition; Stephen Palley, of law firm Anderson Kill; and Lewis Cohen, of DLx Law. Perhaps first and foremost, it doesn’t seem like that the SEC will greenlight a bitcoin exchange-traded fund anytime soon. “I know there are a lot of folks who would love to have the ETF approved but I don’t think that’s very likely,” Long said. She pointed to third-party custody of crypto assets and market manipulation as two stated stumbling blocks for an exchange-traded fund. Clayton made it very clear that he did not trust existing crypto exchanges to prevent price manipulation. The panel noted that Clayton seemed to hint that some kind of move to get bitcoin onto a regulated exchange may be underway, with panelists pointing to remarks made earlier in the day by New York Stock Exchange Chairman Jeff Sprecher. But Cohen argued that bitcoin is a “wild beast” and regulators may not appreciate how hard it could be to tame. To further tame crypto, Clayton also made it clear that anti-money laundering protections had to be put in place for crypto trading. Palley wondered what the implications of that push might hold for the body of retail investors that are active in the market today. Repeating a theme Clayton stressed in his talk, Cohen argued it would behoove crypto startups that raised money in 2017 and early 2018 to go to the regulators now. Earlier this month the SEC issued its first civil penalties to two startups that did not properly register their securities offerings. With those “templates” in hand, Palley said, the SEC might be getting ready to move much faster on ICOs. One of Clayton’s messages from the stage was that the SEC’s doors are open to startups working in the industry, particularly those that are issuing their own tokens. To this end, the agency recently launched a new fintech-focused division with the explicit goal of fostering communication with ICO startups. The panel agreed that what startups in this space want are so-called “no-action” letters (letters in which the SEC confirms that it will not move against a company based on its business model). The letters have long been expected, but no startups have received one yet, according to Long. “If that’s what [Clayton] really wants, for people to come get no-action letters, the U.S. is already behind and we’re gonna fall even further behind,” she said. While regulators are already on it, there’s another frontier for determining the validity of new funding mechanisms for blockchain startups. As Palley asked: “What are courts going to do when they start parsing through token sales?” In fact, it’s already starting to happen. Maybe in 10 years – or perhaps even less – Palley said, the U.S. Supreme Court may take a look. 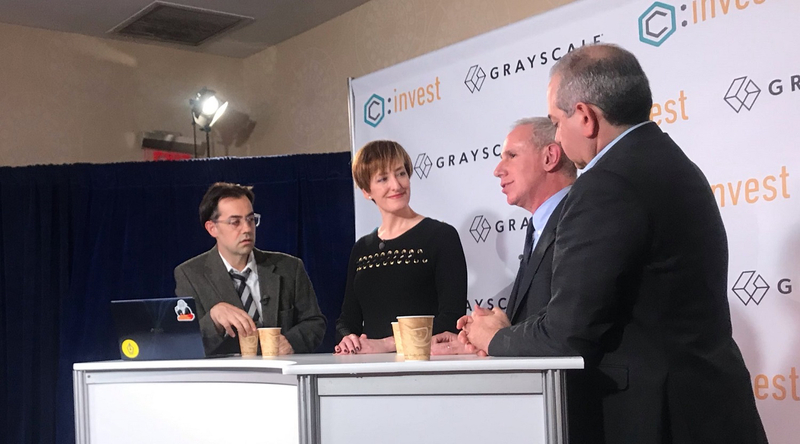 Broadly speaking, Clayton argued from the stage that the SEC is happy to help crypto startups in the U.S. find a way to get in compliance with the law, but our panel of regulatory experts said that, in practice, this turns out to be much more difficult (and costly) than the chairman made it sound.